Vehicles can end up anywhere seemingly in the most inaccessible of places. No job is too difficult for Westbourne Motors. We are the emergency service approved experts; our expertise and technical ability are paramount. 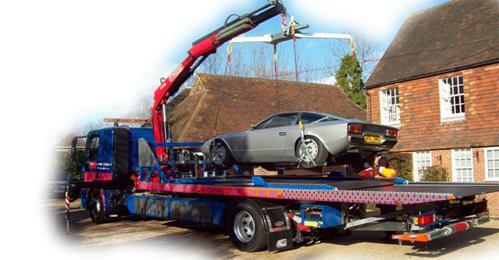 Lorry loader cranes to lift vehicles and preserve evidence. 4 X 4 vehicles to pin point, support and assist recovery personnel. A wide range of specialist equipment to recover vehicles from the most unusual locations, positions and circumstances. Covered transport for discretion or preservation of evidence. Secure and covered car storage facilities at strategic centres across South East England. Dedicated facilities available for forensic and mechanical examinations. Vehicle imaging services to remotely assess vehicles, saving time and money for body shops and insurance companies. A 24 hour, 365 day UK control centre to facilitate the most difficult of operations. Fields, ditches, trees, beaches, multi storey car parks, swimming pools, basements, tunnels, ponds and harbours are all locations where our teams operate …. ..in short, no location is a barrier to Westbourne Motors. Our picture gallery above gives you an insight into the challenges we face on a daily basis. We have over 40 years in the recovery industry and continue to invest in Incident and Recovery training. Knowledge and experience are our two most valuable commodities. Breakdowns or accidents cannot be predicted, thankfully Westbourne Motors experience, expertise and efficiency can be.